Modern society owes a lot to the ancient Greeks. The lives that they led, their belief system, and even the way they created buildings have left lasting impressions that can still be seen today. 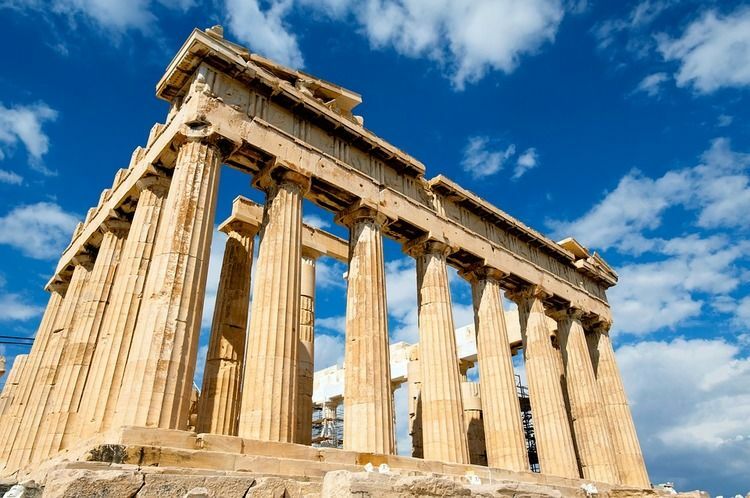 For many, ancient Greece is considered to be the cradle of Western civilization. By taking a look at their way of life, it is possible to see some similarities to today’s world as well as some of the traditions that were pushed aside in exchange for others. The fact the people vote in a democracy, read using an alphabet, and enjoy the Olympics every couple of years can all be traced back to the ancient Greeks. There were four main social classes of people within Athens. The highest class was made up of people born in Athens. Others from different locations could never aspire to fit in with this social group. This upper class was responsible for everything from the government to education and philosophy. If there was any type of work that needed to be done, slaves were required. Most homes in ancient Greece had slaves to take on these menial tasks. The middle class was made up of people that may not have been born in Athens but were working hard at their trade. They were considered free but weren’t given the same rights permitted to the upper class. The lower class of people were just one step above the slaves. In fact, many were once slaves that had gained their freedom. They had even fewer rights than the middle class. And finally, slaves were at the bottom of the social hierarchy. They had no authority and absolutely no rights. Many of the slaves were brought in from other countries. In some cases, their work could eventually pay for their freedom. Sparta had a slightly different social arrangement, with only three classes: citizens, slaves, and craftsmen or traders. The city-state was the central part of ancient Greek life. It was here that all institutions of government, religion, and learning were housed. It was also here that the first principles of democracy were created. In Athens, the people started out with a monarch but transitioned to a government made up of assemblymen who were able to vote. In Sparta, society was set up a little differently, as the focus was on soldiers and war. In both Athens and Sparta, men played an active role in public life, spending time participating in government, learning new things, or working. Meanwhile, the women stayed within the home to carry out the tasks for the household. While slaves may have done most of the upkeep of the home, Greek women were focused on managing their homes. Many would sew clothing for their families or to sell. The education of boys and girls varied greatly in ancient Greece. Girls received an education from their mothers and were taught things like weaving and skills necessary to manage a household. Many were also taught to read and write. Boys attended schools and had a much more varied educational experience. In addition to reading and writing, they were also schooled in things like poetry, math, and physical education. While the training was strict, the experience paled in comparison to that of the students of Sparta. Spartan boys were removed from their families at the age of seven and started their work toward becoming soldiers. Because the girls would one day be the mothers of more soldiers, they were taught things like athletics and even dancing to ensure that they remained in good physical shape. Greek art has had a tremendous influence on the world around us. Think about how many places pillars can be seen in architecture: This is a contribution from the Greeks. The Parthenon is a great example of this style of architecture, and when comparing this structure to something like the White House, the similarities are striking. Outside of architecture, Greek theater is something else that continues to influence the modern world, as the two major genres of theater, comedy and tragedy, were created by the Greeks, forming the basis of modern plays, movies, and TV shows. Today, some art from ancient Greece is still around, including pottery, which gives some indication of what life in Greece may have been like and offers insight into their religious beliefs, including mythology. Among the most famous Greek sculptures still in existence is the Venus de Milo. The religion in ancient Greece was polytheistic, and their gods not only looked human but could take on human form and interact with others at will. Zeus was the ruler of the gods, along with his wife, Hera. Temples were built to honor a specific god, and each god or goddess would have his or her own domain. For example, Poseidon was considered to be the god of the sea, while Demeter was the goddess of the harvest. Works like The Iliad and The Odyssey provide more information about the gods and goddesses that the people believed in and what their different characteristics were. Did the Ancient Greeks Engage in Human Sacrifice?